These Wine Bottle Candle Shelters from Diamond Tech make great centerpieces for anytime of year! 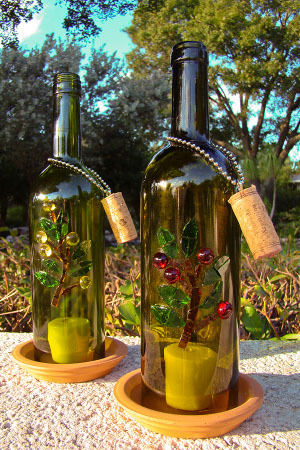 Wine bottle crafts are great for Earth Day and make fun and unique gifts for all your friends. A simple candle makes this a beautiful decoration for inside or out! 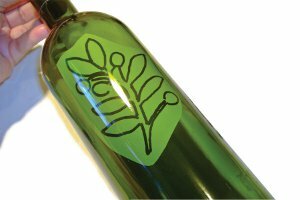 Read and carefully following the instructions contained within the Generation Green (g2) bottle cutter manual. Cover the work area with craft or newspaper. Measure 11” down from the top of the bottle and mark with a Sharpie™. Using the bottle cutter, score and separate where indicated. Smooth the rough edges as instructed in the bottle cutter manual. Clean your bottle inside and out with a window cleaner or for a more natural cleaner use a mixture of 1 cup of water to 2 tablespoons of vinegar. Dry glass surface. MOSAIC TIP! When working on a rounded surface it is a good idea to rest your item on an old hand towel or a ziplock bag filled with rice. This will keep it from rolling around and make it easier to mosaic. Tape the pattern inside the bottle with the image facing out. Using a wheeled glass nipper, nip amber colored bottle into 1/8” wide rectangles of varying lengths or nip amber colored cathedral glass in the same fashion. Glue into place where branches are indicated on the pattern and allow glue to set. 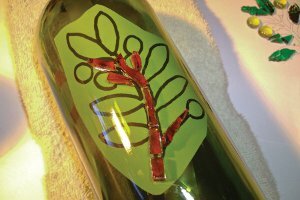 For leaves, place the green cathedral glass square over the leaf pattern and trace around it onto the glass with a Sharpie. 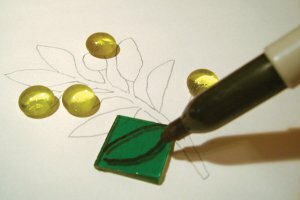 Using a wheeled glass nipper, nip away at the glass until you reach the outline of the leaf. You may choose to glue the whole leaf on the surface of your bottle or, further nip them into halves and quarters for a more mosaic-look. Glue leaves into place where indicated on the pattern and allow to dry. Next, glue medium sized glass gems at the tips of each branch. While your mosaic dries, create your cork bottle snuffer. Insert an eyelet screw into the center top of a cork that will fit snuggly into the bottle. 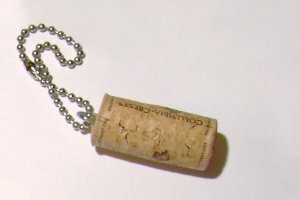 If using a wine bottle the save the cork removed from the bottle. Thread a 6” length of ball chain or a piece of twine or ribbon through the eyelet and secure in place with a knot. Slip snuffer around the neck of the bottle. Place your Candle Shelters and small votive or tea light on a 4.3” clay saucer and display in your garden or on your porch or patio. Glass paints would produce a similar look and not risk the potential sharp edges of the mosaic. Good idea, though. How do you tape the pattern inside the bottle? How do you keep the candle flame burning? The only air hole I see is the opening at the top of the bottle. Wouldn't an opening at the base create the air flow needed to provide oxygen to the flame?